I can't believe how well this site is and you're an example of how well done you put your books at. Delivery was well done. J.K Rowling was well famous for the Harry Potter books when she and her boyfriend went to Manchester together in Scotland. They left from King?s Cross in London England. She found out her mother died and realized Harry?s parents have died too. J.K?s mom died because she was ill. Harry?s parents died when Voldemort killed them. She than discovered that Harry was black haired and didn?t know that he was a wizard. She than knew that Harry became real to her. She got the idea when she was coming back home on the train to kings cross on her own in a crowded train. She didn?t know that the crowded train was full of witches and wizards coming back. She knew that was the idea of how Harry Potter fell into her head. I see those books like they give better detail than in the movie. Things sometimes that come from the book may never be seen in the movie. I can sometimes think that there may be magic in my house when I read those books or a curse that cannot be seen. It can teach little kids who fear the dark or think magic exists that it is make believe in the book and the movie. Sometimes I can laugh at this because things can be funny. Another winner from JK Rowling. It is always refreshing to see that an author is able to deliver books in a subsequent series which are every bit as well-written as the very first in the series. I have found the series to be very readable and transcends the age barriers. Definitely worth having in my library! Who Doesn't Love Harry Potter? 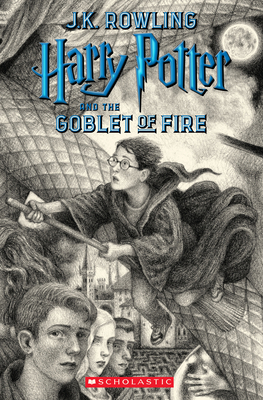 This might by my favorite Harry Potter Book! But I love them all! The Harry Potter series of books are probably the best books I've ever read... and I've read a ton of books. I love them all! If you're 40 and you haven't read these because you think they're children's books - think again!!! These are a must read!! I've read several more than once!